Lying along the vertebral column by the spine, Rat Dorsal Root Ganglion Neurons (RDRGN) are nerve cell body clusters containing afferent neurons that relay sensory information from the peripheral body to the CNS. They are used to study ion channel properties, modulation, neuropathy, peripheral nerve injury, regeneration, myelination, synaptogenesis & more. Figure: Superior Growth of Neurons Cultured in Cell Applications Medium versus Competitor. 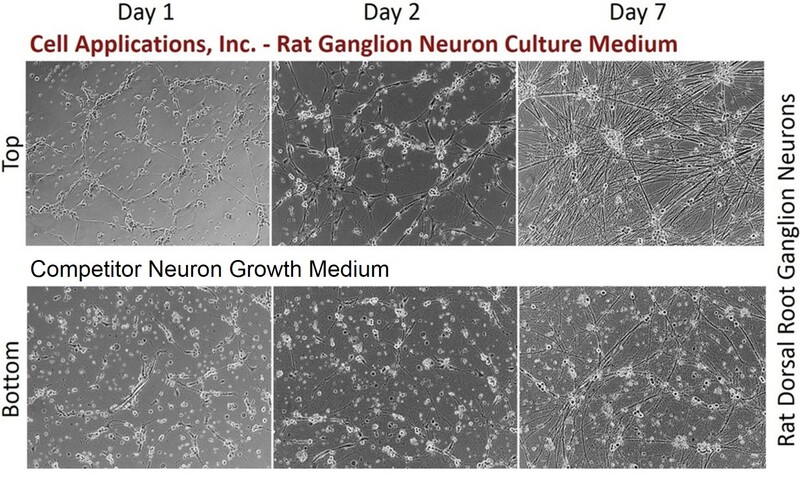 Notably, Rat Dorsal Root Ganglion Neurons exhibit superior viability and neurite extensions when cultured in optimized media from Cell Applications, compared to a leading competitor medium. 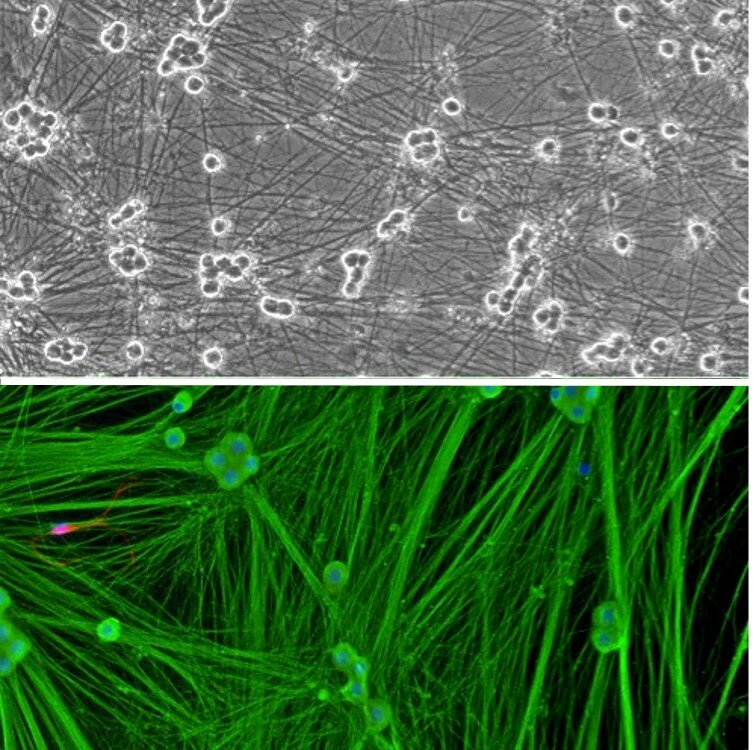 In the above Figure, RDRGN (Cat # R8820N-05) were cultured at a density of at 1x10^5 cells/cm2 in Rat Ganglion Neuron Culture Medium from Cell Applications, Inc. (Top) or competitor Neuron Medium + 100ng/ml rNGF + mitotic inhibitors (Bottom). Microscopic images were captured at days 1, 2 & 7, clearly showing optimal growth in the CAI medium. High quality Rat Dorsal Root Ganglion Neurons (RDRGN) are derived from spinal cords of normal embryonic rat (gestation day 15) by standardized methods. When cultured under the recommended conditions with specialty culture medium, cell death occurs during the first few days after plating. The remaining pure RDRGN arborize and form complex neurite network in one week. RDRGN Stain positive for β III-Tubulin. (Click to Enlarge) Cryopreserved Rat Dorsal Root Ganglion Neurons (RDRGN) revived and cultured for 6 days (top), stained (bottom) on day 14 for β III-Tubulin (green), S100β (red), and DAPI (blue).